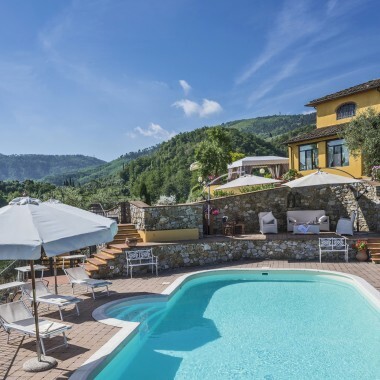 This beautiful rental villa is situated in the Valdinevole, in the heart of Tuscany, on a hill overlooking the ancient spa town of Montecatini. 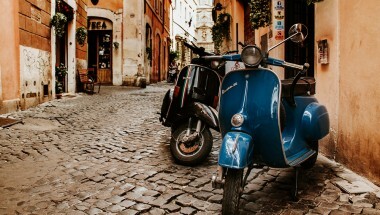 It is an ideal location for visiting not only the cities of Florence, Siena and Pisa, but also the Versilian coast and beaches, and the enchanting Pinocchio Park at Collodi. 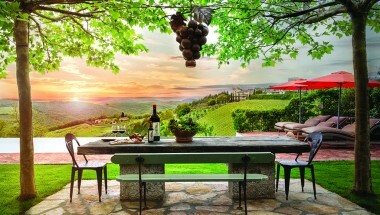 The villa is surrounded by park-like grounds, featuring large expanses of olive groves and vineyards. The olive oil produced on the estate is from olives harvested by hand, and characterised by a unique taste, ideal for accompanying typical Tuscan cuisine, as well as more delicate dishes based on fish. Within the grounds is a swimming pool (15 x 5m), open from the last Saturday in April until the first Saturday in October. There is an outdoor dining area with barbecue. Entrance to the villa is into a reception hall. On this floor there is also a laundry room. A stone staircase leads to the first floor, where there is a kitchen, with dining area, overlooking the garden. The living room, with fireplace as also on this level, as well as double bedroom with a reading room and a bathroom with shower. On the second floor there are four spacious double bedrooms, all with en-suite bathrooms with shower. All the bedrooms have modern, stylish furnishings, air conditioning, and overlook the park-like grounds. Further amenities include TV, DVD player, Hi-Fi, Wi-Fi, a hairdryer and a safebox. As well as the five double bedrooms, all with en-suite bathrooms, there is also a double sofa-bed available. Kitchen equipment includes a dishwasher, microwave oven, fridge/freezer, toaster and Italian coffee maker. 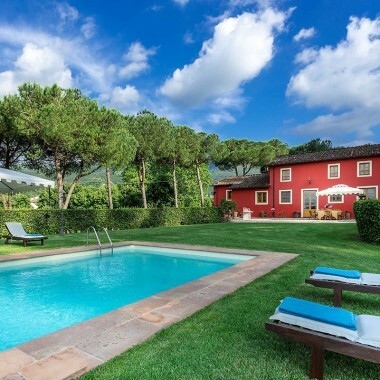 This lovely villa to rent in Tuscany is situated in the Valdinievole, on a hill overlooking the ancient spa town of Montecatini. 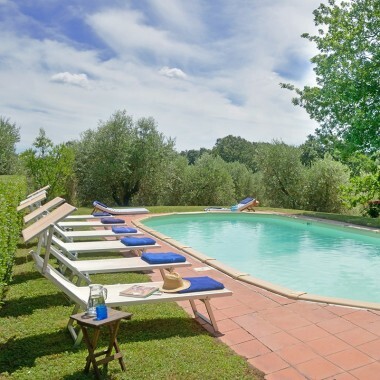 It is an ideal location for visiting not only the cities of Florence, Siena and Pisa, but also the Versilian coast and beaches, and the enchanting Pinocchio Park at Collodi. The property harvests its own olive oil.